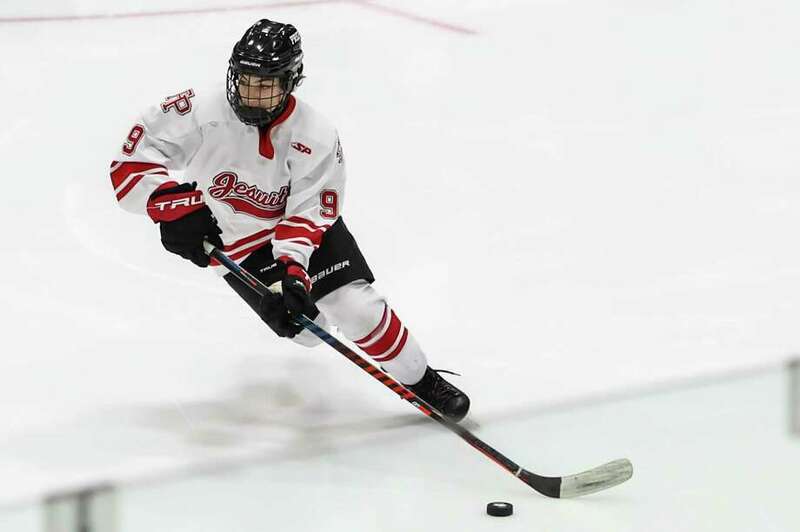 Aksel Sather and Fairfield Prep will face off against Notre Dame-West Haven in the Division I championship game on Tuesday at Ingalls Rink in New Haven. Championship game appearances: Fairfield Prep: 22nd appearance, 17-4 overall, 16-4 Division I. 1977 def. Cheshire 4-3 (Div. II), 1978 lost to Cheshire 6-5, 1979 def. Cheshire 3-2, 1980 def. Amity 3-1, 1981 def. Hamden 3-2 (OT), 1991 def. Hamden 3-1, 1992 lost to Greenwich 3-2, 1995 def. New Canaan 6-1, 1996 def. New Canaan 3-0, 2000 def. Greenwich 2-0, 2001 def. Notre Dame-West Haven 8-0, 2004 def. Notre Dame-West Haven 3-1, 2005 def. Notre Dame-West Haven 4-1, 2007 def. Notre Dame-Fairfield 3-2 (OT), 2008 def. Notre Dame-Fairfield 5-3, 2010 lost to Hamden 6-5, 2011 def. St. Joseph 5-0, 2013 def. Notre Dame-West Haven 3-2, 2014 def. Darien 2-1 (OT), 2016 lost to Darien 4-2, 2018 def. Greenwich 4-2. Notre Dame-West Haven: 18th appearance, 7-10 overall, 7-9 Division I. 1978 lost to Stamford 5-0 (Div. II), 1982 def. New Canaan 4-2, 1983 lost to Enfield 5-4, 1985 def. Darien 10-5, 1986 lost to Hamden 7-6 (OT), 1987 def. Darien 4-3 (OT), 1988 lost to West Haven 2-1, 1989 lost to Hamden 1-0, 1993 def. Trinity Catholic 3-2, 1994 lost to West Haven 7-4, 1997 def. Simsbury 6-3, 2001 lost to Fairfield Prep 8-0, 2002 def. New Canaan 4-1, 2004 lost to Fairfield Prep 3-1, 2005 lost to Fairfield Prep 4-1, 2012 def. Glastonbury 5-0, 2013 lost to Fairfield Prep 3-2. What to look for: These are both teams that more or less started over this year. The Jesuits graduated a significant portion of their 2018 championship team, and the Green Knights were young with a new coach. They have both come together at the right time. The Jesuits were more highly regarded at the start, preseason No. 1 in the GameTimeCT poll, but they struggled out of the gate. They’ve come on in the second half, four lines and four defense pairs deep, trusting senior Jake Walker in net. Meanwhile, the Green Knights have figured out their combinations and developed their depth, too, rolling three lines and mixing in a third defense pair in the semifinals. Notre Dame has won five in a row. Fairfield Prep is 6-1-1 in the past eight. The teams split their regular-season meetings, the Green Knights winning in overtime at home at Bennett Rink, the Jesuits winning 3-1 at the Wonderland of Ice. You should know: Only West Haven and Hamden have met in a CIAC final more times (eight) than the Jesuits and Green Knights. ... Jesuits coach Matt Sather and staff won a title in their first full season, 1999-2000, and have won nine more since then. ... Green Knights coach Larry Vieira won a Division II title with Branford in 1988. ... Hamden has 17 Division I championships, the only school with more than the Jesuits in the top division and the only program with as many overall.